Former Manchester United winger, Ryan Giggs, has urged manager Jose Mourinho, to field Marcus Rashford and Anthony Martial in the same team. Rashford and Martial have combined to score 10 goals already this season. It has helped United start the new campaign with 33 goals in just 11 games in all competitions. 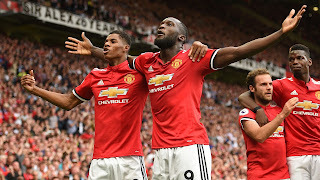 However, Mourinho has been reluctant to play both of them together in the attack, starting the pair in the same team just once this season in their 4-1 win over Burton Albion in the Carabao Cup. “The battle between Marcus Rashford and Antony Martial has been great to follow. “I could definitely see them in the same team, with Marcus being more of a natural centre-forward whereas Martial is more of a left-sided forward but can also play centrally,” Giggs told Sky Sports.